The Avid Certified Expert for Pro Tools (Music) certification represents the pinnacle in Avid’s Music credentials. Exhaustively exploring all advanced aspects of music production, the Expert courses will prepare you to work in a wide variety of musical situations and employ techniques that will distinguish you from the competition. Q-01: Are there any prerequisites? A-01: Yes. You must first earn the credentials of Avid Certified User: Pro Tools and Avid Certified Operator: Pro Tools (Music) to be eligible to enroll in the class for Certified Expert. Q-02: How do I become an Avid Certified Expert for Pro Tools (Music)? 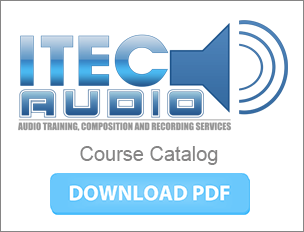 A-02: To certify, you must complete the course, PT310M: Advanced Music Production Techniques, including course projects/exercises at an official Avid Learning Partner, then pass the course completion exams. Q-03: What is the format of the exam? A-03: An Avid Certified Expert exam includes two components â€“ a practical exam and a standard multiple-choice exam. The practical exam is a live demonstration of your skills, during which an Avid Certified Instructor trained in the proper grading process will observe you. You will be required to complete a range of tasks on a sample session, and are graded on the successful completion of those tasks within the allotted amount of time, as well as the efficiency with which you work. For example, some points may be awarded for the appropriate use of specific tools, techniques and shortcuts; and points may be lost if a task is completed incorrectly and needs to be repeated. The multiple-choice exam is comprised of 50 questions and is directly tied to the content the respective course. The time allotted to complete each exam is 60 minutes. Q-04: Can I refer to study materials during the exams? A-04: No. Students are not allowed to reference any documentation or study materials during the exams. Q-05: What happens if I take the exam and do not pass? â€¢ If a student does not pass an exam, the candidate may retake the exam after 24 hours have passed. â€¢ Once a student has passed an exam, it may not be taken again for that version of the Avid product. Q-06: What will I receive if I successfully pass the exam? 1. Official certificate available for printing or download, proving your Avid Certified Expert status. 2. Downloadable Logos, for use in your business marketing materials such as business cards and websites. Q-07: How long is certification good for?A-07: Your Pro Tools certification does not expire. You become certified for a particular version of Pro Tools software. Avid Certified Experts have an option to update their certification to a newer version by taking the Pro Tools update exam. Contact your local Avid Learning Partner for more information.